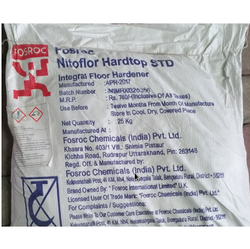 Leading Wholesale Trader of colpor 200pf grey, thioflex 600 gun grade grey sealant, nitoflor hardtop standard (25kg) floor hardener and thioflex 600 pouring grade grey from Nagpur. Uses For the sealing and maintenance of joints in concrete roads, concrete runways and hard standings. 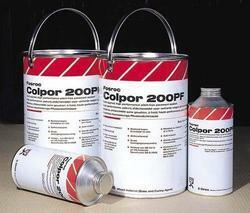 Colpor 200PF is particularly suitable for sealing areas where fuel and oil spillage might occur such as aircraft hardstanding areas, oil terminals, garage forecourts, parking and cargo bays. Uses Sealing high movement joints in building and civil engineering structures, including superstructures, floors, basements and subways. Advantages „ Forms a tough, elastic, rubber-like seal „ Accommodates continuous and pronounced cyclic movement (± 30%) „ Adheres to most common substrates „ High resistance to ageing reduces physical damage due to climatic extremes „ Easy mixing and application „ Safer lead free curing agent Description Thioflex 600 Gun Grade is a two-component joint sealant, based on a liquid polysulphide polymer which, when mixed and applied, cures to form a tough, rubber-like seal. The cured sealant exhibits excellent adhesion to most primed surfaces including concrete, glass, aluminium and stainless steel. Thioflex 600 Gun Grade is ideal for general applications and is packed in a ready-to-mix pack consisting of the base and curing agent in the correct proportions. Thioflex 600 Gun Grade is particularly recommended for use in civil structures, high rise buildings and other applications where access for subsequent maintenance will be difficult and the risk of early movement failure must be minimised. It is also suitable for sealing joints in brickwork, retaining walls. Uses Nitoflor Hardtop / Nitoflor Hardtop Standard provide a highly abrasion resistant surface to concrete floors by the dry shakeon method which ensures that the hardwearing surface bonds monolithically to the base concrete. They are ideally suited for all industrial areas subject to the heaviest traffic, e.g. loading bays, trucking lanes, car parks, workshops, machine shops, ramps and spillways. Advantages „ Non metallic - does not rust or stain. „ Provides a hard, abrasion resistant surface „ Forms monolithic bond with base concrete „ Easy and economical to apply. Uses Sealing horizontal movement joints in building and civil engineering structures, including roads, floors, airfields and subways. Advantages „ Forms a tough, elastic, rubber-like seal „ Accommodates continuous and pronounced cyclic movement „ Excellent adhesion to most common substrates „ High resistance to ageing reduces physical damage due to climatic extremes Description A multi-component joint sealant, based on a liquid polysulphide polymer, which when mixed and applied, cures to form a tough, rubber-like seal. The cured sealant exhibits excellent adhesion to most primed surfaces including concrete, aluminium and stainless steel. 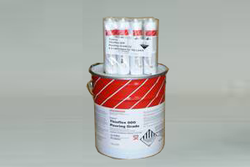 Thioflex 600 Pouring Grade for joints in horizontal surfaces is supplied in grey colour only in 4 and 16 litre packs with the base and curing agent in separate tins. 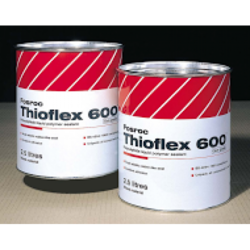 Thioflex 600 Pouring Grade is recommended for sealing expansion joints and stress relief joints in floors or other horizontal surfaces. Looking for Industrial Flooring & Sealants ?